(CNN) -- The death toll from flooding in the Philippines climbed to 140 Monday as a tropical depression in the Pacific sparked new fears of flooding. iReporter Doranne Lim captures the desperate measures some people are being forced to take. Flood water began to subside after a weekend that saw Manila hit with its heaviest rainfall in more than 40 years. More than 80 percent of the capital was under water at one point Sunday. The deluge caused by Tropical Storm Ketsana, which has since strengthened into a typhoon, engulfed whole houses and buses. 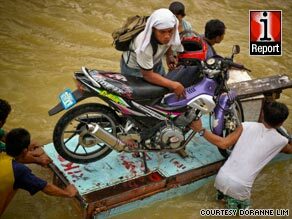 Manila, on the island of Luzon, and the nearby province of Rizal bore the brunt of the storm. People huddled on rooftops Sunday waiting on army helicopters to pluck them to safety. Others used ropes to wade through waist-deep muddy waters. "Right now the challenge is to find out how many people have actually died and how many people we have to take care of in terms of people who've been displaced," said Richard Gordon, the chairman of the Philippines National Red Cross. "We're really talking about maybe hundreds of thousands of people," with about 280,000 to 300,000 displaced in the island of Luzon alone, he said. Though the Philippines is no stranger to floods, Saturday's downpours approached a record, with a month's worth of rain falling within six hours. The average rainfall for the month of September is 391 mm (15.4 inches), said Gilberto Teodoro, chairman of the National Disaster Coordinating Council. The capital experienced 341 mm (13.4 inches) between 8 a.m. and 2 p.m., he said. Officials worried that if the rains return, they could bring more floods if reservoirs burst. "We're hoping that there will be no more breaching of the dams," Gordon said. "That's one of the things that are very disconcerting to many people right now." Mike Anthony Catuira spent Sunday retrieving valuable belongings and seeking cover on higher ground. Overflowing rivers in the municipality of Tanay in Rizal province had inundated shops and homes, he said. "The storm's local name 'Ondoy' is really a powerful storm, and this is the most severe storm in my whole life," he said in an iReport video to CNN.